Today's mission is to declutter user and owner's manuals that you don't need anymore, as well as warranty documents that have expired and are no longer needed. This mission is designed to be done while working on the Organize Passwords, Manuals & Warranties Challenge here on the site, which is part of the 52 Week Organized Home Challenge. 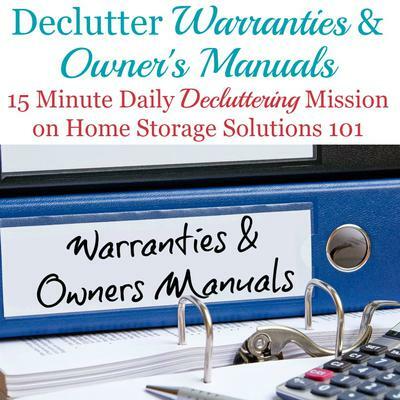 Tomorrow we'll focus on organizing the warranties and manuals you have left, but you definitely don't want to be organizing stuff you don't need, so today's mission is the vital first step in the process. Fortunately, deciding what warranty documents and owner's manuals you actually need to keep, versus toss (into the recycling bin) is not as complicated as it is for some documents, like tax documents for example. Instead, deciding what to keep versus get rid of is pretty straight forward. Keep the owner's manuals as long as you own the equipment or appliance that it goes with. When you get rid of the product you can get rid of the instructions for it too. Same thing for warranties. If the warranty has expired, because it's been too many years, or you don't own the item anymore, or for whatever other reason the warranty no longer applies, it is no longer needed. Work on this mission for 15 minutes at a time, and tackle it like you would when getting rid of any other paper clutter. Below we'll also quickly explore a way of digitally organizing your owner's manuals to further reduce the amount of paper in your home. However, depending on how many pieces of equipment, appliances, and various types of technology that you own you still may have quite a large stack of user's manuals to deal with. For some people keeping the paper versions of these manuals is totally fine. 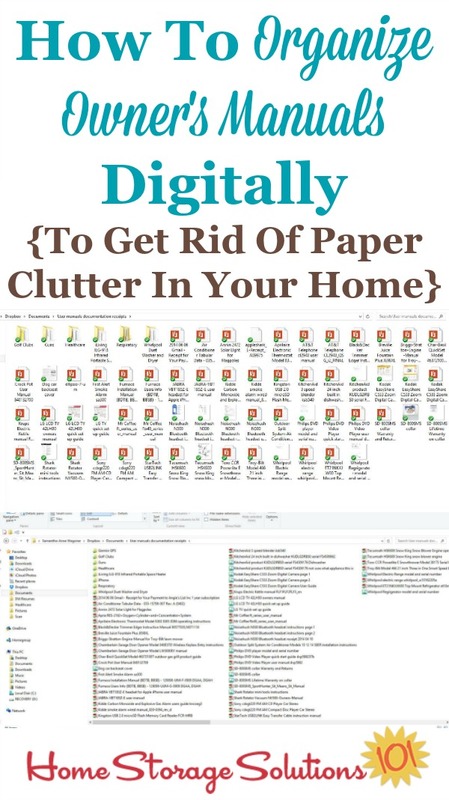 However, if you want to get rid of even more paper in your home one thing you can do is find these manuals online, download the PDF of the manual onto your computer and then discard the paper copy from your home. Several years ago this may not have been feasible, but these days the majority of the manuals are available online. So that's exactly what one reader, Samantha, has done and she was gracious enough to send in the screen shots above showing how they're organized in her digital files. She explained, "Here's what my list looks like on my laptop for the files for user manuals, etc. I don't think there are any I haven't been able to find. I often use the number on the back of the user guide that denotes the document to find it online." To do this for yourself start by creating a folder on your computer that will hold all your manuals, labeling it something obvious, like "owners manuals." Next, do exactly what Samantha did and go through your stack of manuals typing in the relevant information into the search engine of the name and model number of the product, along with the term "owners manual" or "users manual" or whatever the document, in print, is titled. As you find these documents online save a copy of the PDF version into the digital folder you've designated for this purpose. Sometimes when files are saved they have strange numbers or words that later we don't recognize what they are. Therefore, as soon as you save the document go ahead and change the file name to something you'll be able to recognize later, such as "washing-machine-Maytag" or similar. As with any type of digital files you want to make sure all your hard work doesn't go to waste if your computer hard drive dies, so make sure that you have a system in place for backing up these files for the future so you can retrieve them as needed. As you get rid of an appliance or piece of equipment you can just delete the now obsolete PDF document from your digital files, keeping only the relevant ones available at the click of a mouse! 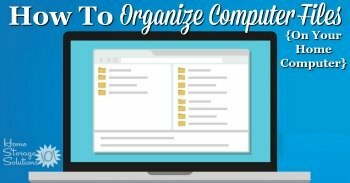 You can get more information about how to organize computer files here. I hope seeing these pictures, and reading these simple instructions have inspired you to get rid of paper clutter in your home, including old and outdated warranties and owner's manuals. 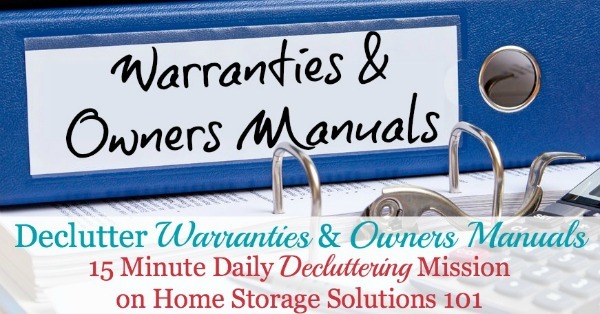 Plus, now that you've decluttered all your old warranties and manuals, make sure to check out the follow up article all about organizing warranties and manuals here. I did this not so long ago, and yes, yes, I took a trip down memory lane, appliances I don't even remember owning, and who really ever needs a manual for a toaster anyway? Fab idea about storing the manuals digitally too! Not that we ever read the 'destruction' manuals (as they're known in our abode) but guaranteed if we recycled them - we'd need them! This is a great idea. Only caveat I'd submit is keeping manuals for items you think you will sell or leave with your house if you move--i.e. major kitchen appliances or other big ticket items. While the new owner can look up the manual online, these bigger appliances often have a couple manuals and piece-parts so it's often more convenient to have all the paperwork and pieces together (especially big manuals). If the documents come in a bag, I keep the papers in there, along with the receipt (after I've scanned the receipt--they can fade!) or I use document holders and ziplock bags when piece parts are involved. I keep all these docs in a plastic storage container because the piece parts don't file well. It's not a pretty system but keeps it all together, yet somewhat organized. I'd be interested to hear of other methods. I've been thinning medical papers I've had for years. I'm keeping the visit papers and getting rid of the billing statements that have been paid and the EOBs.I have found that I didn't have the Dr visits or testing/labs, so I kept the bill or insurance EOB as it puts the itemized procedures and date. The folders had lightened up considerably! I'm trying to make it easy for my family, so they won't be stuck with having to go through it all. I really enjoy your blog! I've donated lots of items, recycled and tossed. Plenty more to do. Keep up the greatness everyone. I feel so much better getting rid of the clutter! For all our large appliances I've purchased large clear plastic envelopes that will hold the manual and paperwork for the appliance, then attached the envelope with hook-and-loop strips somewhere on the appliance that's easily accessible.